Hey everyone. For a while now I’ve been making a guide series focused on helping you climb the ranked ladder. I got the inspiration for these guides when I got stuck at the same rank for a few weeks and couldn’t find any new decks to try. Nowadays there are a lot more guides and videos around, but I hope you can find mine useful. I also make YouTube videos to work with these written guides, for those of you who want to see the deck in action. There are some things that I might miss in the video, as I try to keep them short, so I recommend you check out both the written and video portions. 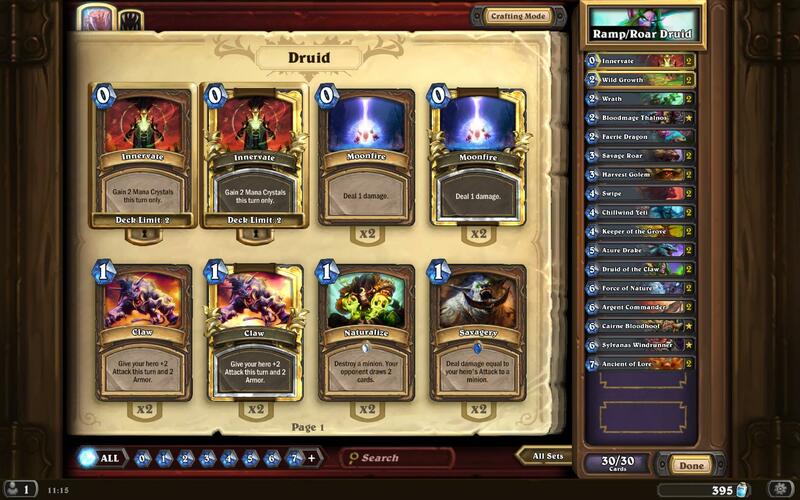 This video guide covers the current iteration of a savage roar druid deck I’m having good success with. It shows you the reasoning behind each and every card in the deck, along with replacements for legendary cards you might be missing. There is a brief mulligan guide along with a few games of ranked footage. I’m happy to show both wins and losses in my video guide series, but it just so happens that I beat both a generic shaman and an aggro/face warlock when showing the deck off. The video itself is just over 20 minutes long, so if you are a visual learner, you’ll benefit from checking it out. Anyway, onto the guide itself. Fast Ramp Druid: Why stop at only one kill combo? NOTE: If 2+ cards work well together, I will only mention it once, the first time it comes up. 0 Innervate (x2): Innervate is an incredibly powerful card. It is here to give you flexibility in your mana total and allow you to create or deal with threats that would be otherwise impossible. A good example of this is using Coin + Innervate + Chillwind Yeti on turn 1. The Chillwind is a threat that often cannot be removed for 2 or 3 turns, which is an extra 8-12 damage to the opponents face right at the start of the game. You should always innervate to bring out a strong minion 2 turns early, given the opportunity, as it creates an enormous tempo swing in your advantage that few decks can answer. Coin + 2x Innervate + Ancient of Law (draw 2) on turn 2 is the dream opener, as its a 5 5 and your hand is not empty. 2 Wild Growth (x2): If you don’t have the innervate play early, Wild Growth acts similarly. It gives you more mana than your opponent every turn, which this deck can take advantage of. You should only Coin + Wild Growth if your hand contains a good play for 3, 4 and 5 mana. Think about how much mana you will have for the next few turns and what plays you can make with the extra mana crystal. If you can’t use it well, it may be worth playing Wrath or Faerie Dragon instead. Wild Growth is better than Shapeshift to the face though. Also, using Wild Growth when you have 10 mana crystals, you will draw a card. Sometimes it may be better to save the Wild Growth instead of using it for mana. Use your best judgement. 2 Wrath (x2): Fantastic removal card. Kills most 1/2/3 mana minions and can also be used to draw a card like a rogue would with Shiv. Scales well with spell damage. Use this to remove threats early vs aggro decks. It can be worth saving against something like Handlock though, as plays like Bloodmage Thalnos + Wrath (x2) are one of your only good outs against taunted 8 8 giants. Feel free to overkill minions with this card, as it is so efficient anyway. 2 Bloodmage Thalnos (x1): This guy is your cheap spell damage card. 90% of the time you will play him the same turn as you play your spells to gain immediate advantage of the spell damage. Thalnos + Innervate + Swipe will completely shut down an aggro deck and will probably win you the game. The 10% of the time you play him without a spell is when you have no good plays for the following few turns and need to dig through the deck for a better hand. REPLACE WITH KOBOLD GEOMANCER IF YOU DON’T OWN BLOODMAGE THALNOS. 2 Faerie Dragon (x1): Completely unimportant card here that is used to fill out the curve a bit more nicely. Good vs rogue/mage/zoo as it can’t be targeted with spells. When playing this card, ensure that you position it between two of your strongest minions, as it makes your board better against Betrayal, Cone of Cold and Explosive Shot. Replace this card with anything you fancy, as it isn’t crucial to how the deck works. 3 Savage Roar (x2): Your win condition is Force of Nature + Savage Roar for 9 mana. It deals 14 (+2 per minion on board) instantly. Force of Nature + Innervate + Savage Roar x2 costs 10 mana and deals 22 (+4 per minion on board). This card is why there are so many durable minions and charge minions in the deck. You should check for lethal every turn that this is in your hand, as sometimes you can use it with a Druid of the Claw (4 4 charge) or an Argent Commander for the win. Remember that Savage Roar gives your hero +2 attack for the turn. 3 Harvest Golem (x2): Durable 3 drop minion. This guy trades well against aggro decks and must die twice, making him useful with Savage Roar. If your opponent silences Harvest Golem, you are ahead as that is one less removal for your Cairne Bloodhoof or Sylvanas Windrunner. 4 Swipe (x2): Use it to help you clear the board or trade better against a board. This card is the main reason that this deck crushes a lot of aggro matchups. Scales with Spell Damage very well and can often be used on the opponents face when rushing for lethal. 4 Chillwind Yeti (x2): Durable 4 drop minion. Trades well against everything. Play him when you can as he is just such a strong neutral minion. 4 Keeper of the Grove (x2): Amazing flexible 4 cost minion/removal. Against aggro use it to remove Flame Imps/Knife Jugglers/Mana Wyrms. Against control use it to silence big threats like Tirion Fordring. You can also use it to silence taunts when pushing for lethal damage. Make sure you don’t rush to use it if you know your opponent has a target you really want to silence, but sometimes you just have to remove something smaller in order to take control of the flow of the game. Use your best judgement. 5 Azure Drake (x2): Simple 5 drop minion. Spell damage makes this a great card with Wrath or Swipe. Drawing a card the turn you play this makes it an easy minion just to chuck onto the board when searching for your win condition. A very easy minion to play, regardless of the enemy board. 5 Druid of the Claw (x2): Flexible 5 drop minion. This deck will often use the 4 4 charge over the 4 6 taunt. When vs aggro, the charge guarantees that you at least kill one of his minions, whereas the 4 6 taunt can be removed with spells. The Taunt is also weak to The Black Knight. 6 Force of Nature (x2): Win condition. Feel free to use as removal/board clear if necessary, as you have a second one. 6 Argent Commander (x2): Great 6 drop minion. Vs an empty board, feel free to use to push for lethal damage. Against aggro, it will usually 2 for 1, which can keep you in the game. Be wary of spell damage + Earth Shock. 6 Cairne Bloodhoof (x1): Durable 6 drop minion. Great with Savage Roar as it takes forever to kill Cairne. Just play this card when you have 6 mana, as he trades incredibly well. Innervating him out wins games by itself. Weak vs Hex/silence. REPLACE WITH BOULDERFIST OGRE OR SUNWALKER IF YOU DON’T OWN CAIRNE BLOODHOOF. 6 Sylvanas Windrunner (x1): Similar to Cairne as a 6 drop minion that trades really well. Same weaknesses, but has different strengths. The extra attack on Sylvanas makes it a more aggressive play than Cairne when pushing for lethal damage. REPLACE WITH BOULDERFIST OGRE OR SUNWALKER IF YOU DON’T OWN SYLVANAS WINDRUNNER. 7 Ancient of Lore (x2): Most expensive card in the deck. Draws you 2 cards vs control or keeps you alive vs aggro. Use your best judgement on the battlecry and think about what you need; life or a better hand. It also leaves a minion on the board for use with Savage Roar, and 5 attack is quite respectable. Always keep: 0-4 cost cards. Innervate and Wild Growth will make your life very easy, so preferentially keep these. Try to have a play every single turn. So keep in mind your potential mana totals when using Innervate and Wild Growth. The 2/3/4 cost minions are all good to keep. Anything 5+ can clog up your hand. Never Keep: Savage Roar. Force of Nature. Anything above a 4 drop. If you have innervate, you can keep up to 6 drops. 2 Innervates and you can keep anything you fancy. Abuse Innervate as much as possible to make crazy power plays. IMO the card is way too powerful, so take advantage of it constantly. Keep track of the damage you have dealt and can deal to your opponent every turn, as you can often find you have lethal without having both Savage Roar and Force of Nature in your hand at the same time. Every minion on your side of the board is a potential Savage Roar target, even Bloodmage Thalnos. Keep this in mind when trading and try to keep your minions alive if possible.